This is one of those recipes that you make and you say, “Oh….WOW!” I snack on nuts every day. Cashews are one of my favorite nut, all buttery and crunchy, yummy on salads or just by the handful. This is a fantastic way to eat a cashew. 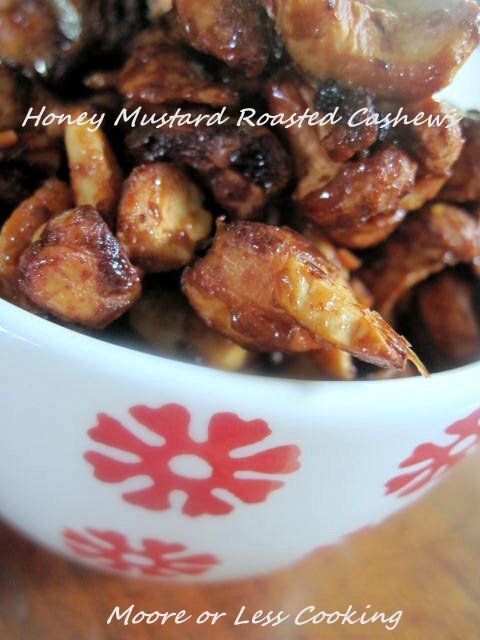 I could eat up every little last piece of these wonderful Honey Mustard Roasted Cashews, but I must refrain myself! Your friend’s will be thrilled if you make these before you go to a party and bring them as a gift, or else you may be sitting in front of the computer shopping and then unbeknownst to you, your bowl of nuts has vanished! Not that this happened to me or anything like that. This is one of those recipes that you make and you say, “Oh….WOW!” I snack on nuts every day. Cashews are one of my favorite nut, all buttery and crunchy, yummy on salads or just by the handful. This is a fantastic way to eat a cashew. 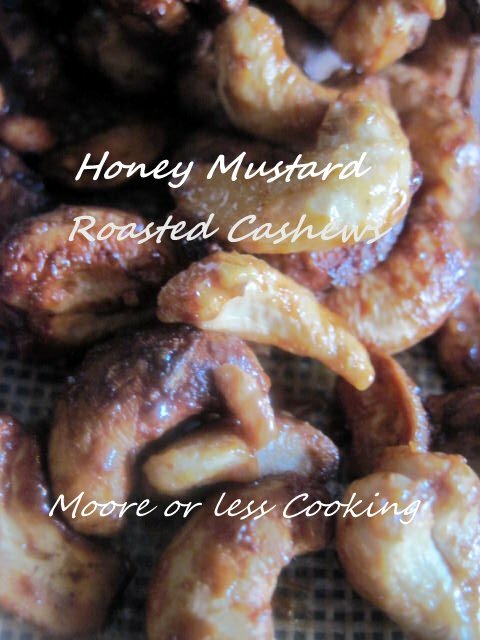 I could eat up every little last piece of these wonderful Honey Mustard Roasted Cashews, but I must refrain myself! In a bowl, stir together the honey, olive oil, mustard, red pepper flakes, and salt. If the honey is very thick, microwave it for a couple seconds to make it thinner, this will be a better coating for the cashews.. Toss cashews into honey mixture and coat cashews well. Place cashews in a single layer on baking sheet and bake at 375 for 10-15 minutes until fragrant, stir halfway through the cooking time. Keep an eye on the cashews after about 12 minutes. The cashews can burn quickly. Remove from oven. Toss to coat and loosen from the parchment. Allow to cool before enjoying. Store in an airtight container at room temperature. I just stoped by to see how you did the nuts ! Thank you Nettie for stopping by, hope you enjoy this recipe! Love cashews!